Donald Trump, US president, says hip hop mogul Shawn ‘Jay-Z’ Carter has a “filthy language”. Trump took the fresh swipe at Jay Z on Tuesday during a rally in Tennessee. 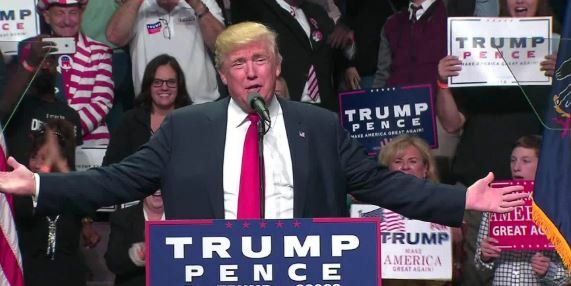 Referencing a 2016 Hillary Clinton rally in which Jay Z performed, he said the rapper’s language made him(Trump) seem like the “the most clean-cut human being on earth”. Trump said that Clinton sat and watched while Jay Z “used the F word”. He said the rally was the only time the Democratic party presidential candidate pulled a large crowd during her campaign. He said: “The only way she filled up the arena was to get JAY-Z. And his language was so filthy that it made me, like, the most clean-cut human being on earth. It’s true. “He’d stand up there before those crowds, and by the way, without any musical instruments, I had much bigger crowds than he was drawing. Big Sean, Chance the Rapper, and Beyoncé were some of the artistes who performed at the rally Trump was referencing. Jay Z was among those who criticised Trump after he reportedly described African countries as “shithole”. “You are so misinformed because these places have beautiful people and beautiful everything,” the rapper had told Trump.